hopefully her thought will count double. I’m not good at baking. Cooking, that’s different. I do okay there. Or at least I don’t usually make massive failures. But baking? That weird science where you put something in a bowl or pan, shove it into a heat box and hope for the best? I screw that up almost every time. And I screw it up 100% of the time if there’s either chocolate or a “from scratch” element involved. So when Cat wanted to come over to make homemade brownies for her sweetheart on Valentine’s Day, I tried to break it to her that just because she thought I was “crafty,” that didn’t mean I was Martha Stewart. 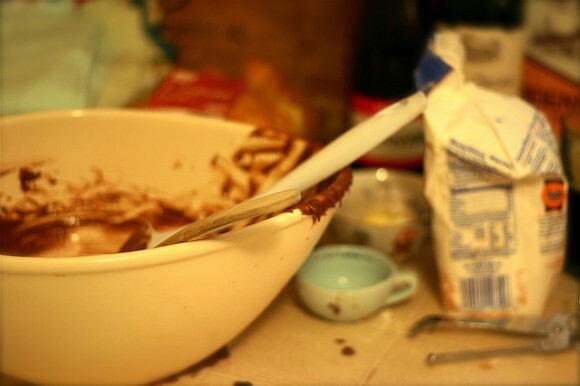 In fact, I’ve never successfully made brownies from scratch. “Have you tried a lot?” she asked. After we poured the batter into the pan, we took a little taste. “Man, that’s sweet,” I said. The flour. We hadn’t added it. Flashback to the only other time I’d attempted homemade brownies. I was thirteen or so, and I was trying to make them in the microwave and I’d accidentally used powdered sugar instead of flour, making brownie candy that was beyond disgusting. So the oven is on a bit of a tilt. I don’t know… fault lines, mountains, hills, whatever. It’s normally not a problem because I’m not baking or cooking something that has to rise. Because of the tilt, half of the brownie mixture had fallen to one edge of the pan, making a centimeter-thick finished brownie cookie on one side, rising up to a four-inch battered mess on the other. We made a brownie ramp. “No, wait,” I said. And because Cat figured I’d somehow save the day, she gave me the complete control to accidentally ruin it. I took the pan in both hands and started rocking it back and forth, kind of shaking it to even out the batter, oozing the uncooked mess on top of the thin brownie part. Honestly, that had never occurred to me. I cut off a corner and put it in my mouth. I don’t know how to explain the chemical reaction that happened, other than to say it was like we’d made Brownie Pop Rocks. Instantly the chocolate sizzled, popped, and then shrank into a tiny little hardened caramel chew on my tongue. I dumped it from my mouth into the sink. We pulled them out and tried to rescue the 3″x3″ space that wasn’t completely ruined. We cut tops of the brownies off and tried to make them look like they weren’t brownies we found under the couch. Poor Cat even gave a half-hearted sprinkle of Peppermint bits all over them. But it was too late. The brownies. They were ruined. And we couldn’t do them again because we didn’t have enough time to go buy chocolate chips, which Cat refused to work without. It’s been a couple of days since this adventure, and my glass baking pan is still in the sink, soaking, trying to get the hardened brownie rocks off the bottom. Things evened out when I tried to teach Cat how to sew something, and she got impatient while I took a phone call and almost sewed her finger to some fabric. By the time she was finished stitching and stuffing, I think we’d salvaged enough of her valentine’s day project that I hadn’t completely ruined her chances of getting some the next night. I’ll totally help you hem that skirt. But please don’t ask me to handle your bundt cake. And now, if you’ll excuse me, I’m off to work! Next Article 2008 Dewey Donation System Book Drive Begins!